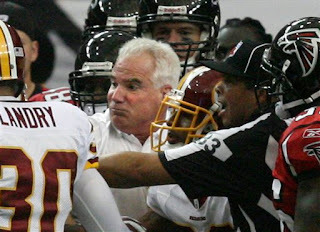 Falcons head coach Mike Smith in the middle of a scuffle after a late hit by the 'Skins on Falcon QB Matt Ryan. The players must want to run through walls for him. Falcons are up 31-17 at the time of this post. Fire in the belly , Baby! Smitty is quickly working his way up on the list of all-time Falcons coaches, in just a very short period of time. I was a little disappointed in how he pulled back the throttle once they got up 3 TDs today (very Richt-esque), but they pulled it out thanks to Turner. I'm sure CMS learned his lesson and next time he'll keep the gameplan in place. Football is not a sport you can let up in. Momentum is big. I'm still hoping that CMR will learn that someday while he's still coaching the Dawgs.